Right ventricular (RV) injury may occur while performing repeat sternotomy. The risk can be reduced by using cardiopulmonary bypass (CPB) through the femoral vessels. Femoral artery-related complications such as acute limb ischemia, muscle necrosis, and compartment syndrome are common when occluding femoral cannulas are used for long duration of CPB. Small caliber femoral artery in a child may get injured if a large cannula is used for CPB. Interposition Polytetrafluoroethylene (PTFE) graft has been used by many surgeons in adults with femoral  and axillary arteries  to prevent such complications, but its use in pediatric patients in the emergency setting has not been reported to our knowledge. We report a case of RV injury during sternal debridement for chronic osteomyelitis following secundum atrial septal defect (ASD) closure in a 4-year-old child, which was successfully managed using CPB initiated through a 6-mm PTFE interposition graft anastomosed to the femoral artery. A 4-year-old female child weighing 11 kg underwent corrective surgery for secundum ASD. Postoperatively, she developed sternal osteomyelitis, which did not respond to conservative management. Hence, debridement of the affected sternum and muscle flap reconstruction was planned around 4 months after the initial surgery. A pre-operative computed tomography (CT) scan confirmed the diagnosis and showed that the sternum was broken in several places and was close to the heart at several places. However, while performing debridement of the affected sternum, an inadvertent right ventricular injury occurred. The injury was significant and therefore, a gauze pack was immediately placed to achieve hemostasis. This helped in maintaining stable hemodynamics till arrangements for CPB were made. At the same time half dose of heparin (150 IU/kg = 1600 IU) was given. Because of dense adhesions, it was not possible to establish CPB through the chest. Hence, the groin vessels were exposed, but the femoral artery was found to be thin and fragile for direct cannulation. 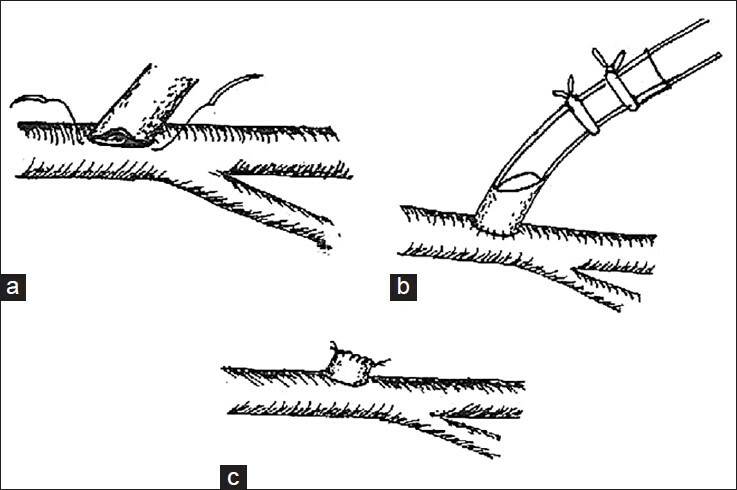 A 6-mm standard PTFE graft (Goretex®, W.L.Gore & Associates, AZ, USA) was sutured to the longitudinal arteriotomy in an end-to-side fashion with a 7-0 polypropylene suture [Figure 1]a. Following completion of full heparinization (300 IU/kg = 3300 IU), the graft was cannulated with 16 F femoral arterial cannula and was tied around the cannula doubly [Figure 1]b and [Figure 2]. The cannula was connected to the standard arterial inflow tubing from the arterial pump head (primed with 500 ml of priming volume and 200 ml of packed cell) to establish CPB and venous return was maintained by pump suckers placed near the site of RV injury on removal of the gauge pack. The maximum pump flow achieved was 1.0 L/min (full aortic flow was 1.5 L/min) with a pump line pressure of 150-170 mmHg. The perfusion pressure was maintained between 30-50 mmHg throughout the time (22 minutes). The rent in the RV was repaired by pledgeted 4-0 polypropelene horizontal mattress sutures. While terminating the CPB, the graft was not disconnected from the artery but excessive length of the graft was amputated flush and the end of the graft was closed by continuous 6-0 polypropelene sutures [Figure 1]c.
The damaged sternum was excised and skin was closed loosely and wound dressings were commenced. During the surgery and immediate postoperatively, due to the unexpected blood loss, she required transfusion of 2 units of packed red blood cells. Postoperatively, the patient did well and there was no evidence of leg ischemia with normal pulses in the lower limbs. She was discharged after complete healing of the sternal wound on postoperative day 25. At 2 months of follow-up, she had a healthy wound and lower limb pulsations were normal on examination. Even cannulation for percutaneous (femoral artery and femoral vein) bypass with smaller and presumably non-occluding catheters over a short period of time leads to an 11% incidence of femoral complications with a 2% incidence of femoral occlusion. Risk of ischemic injury, occlusion, and arterial damage is higher in children than in adults because of smaller and delicate vessels. Moreover, it is not possible to establish full flows using these cannulas because of size limitation. A much bigger cannula can be inserted in a graft. For instance a 16 F cannula fits snugly in a 6-mm graft and a 20 F cannula in 8-mm graft. Perfusion of the femoral artery via a graft sewn end-to-side onto the artery provides bidirectional flow and thus eliminates distal ischemia. This was suggested (but not employed) by Gates et al.,  in their description of 2 adult patients with thigh ischemia after cardiac operations performed with femoral arterial perfusion. Cannulation by the technique described above distributes arterial flow by the relative resistance of the perfused vascular beds. Excessive blood flow to the perfused leg (or inadequate flow into the remainder of the body) may be bothersome and may affect whole body perfusion. Many authors believe that blood flow is controlled by autoregulation. Blood pressure measurement in the grafted limb is essential to watch for overperfusion. In such a situation, the surgeon may go for snaring of the femoral artery distal to the graft insertion. In our case, we could obtain adequate whole body perfusion ascertained by pressure in the radial artery. Although cannula insertion with this technique first requires sewing a graft onto the femoral artery and thus takes longer to initiate CPB, the procedure is devoid of arterial complications. It can safely be accomplished in around 10 minutes. Alternatively, the external iliac artery can also be exposed. However, we believe a much bigger cannula can be inserted in a PTFE graft. We could achieve flow of 1 L/min with perfusion pressure of 30-50 mmHg with a line pressure of 150-170 mmHg using a 6-mm PTFE graft. Although the desired full flows were 1.5 L/min, incomplete drainage from the RV injury site was the reason for a flow of 1 L/min. The technique is not free from complications. Suture line bleeding may occur through the needle holes in the PTFE graft during CPB. This may be eliminated by taking closer bites on artery as well as on graft and by giving a smaller dose of heparin while performing the anastomosis, and deferring the larger dose required for CPB until shortly before its initiation. It could also be reduced by using a collagen-impregnated and knitted Dacron graft. While terminating CPB, either the graft stump can be cut flush the artery or a pericardial patch repair of the artery can be made. An immediate decision of packing the bleeding site from RV saved the life of the patient. Interposition PTFE graft can be safely used in redo pediatric cardiac surgeries while initiating CPB by femoral route in emergency setting especially when prolonged CPB is anticipated and femoral arteries are thin and fragile. DeLeon SY, LoCicero III J, Ilbawi MN, Idriss FS. Repeat median sternotomy in pediatrics: Experience in 164 consecutive cases. Ann Thorac Surg 1986;41:184-8. Morales DL, Zafar F, Arrington KA, Gonzalez SM, McKenzie ED, Heinle JS, et al. Repeat sternotomy in congenital heart surgery: No longer a risk factor. Ann Thorac Surg 2008;86:897-902. Hendrickson SC, Glower DD. A method for perfusion of the leg during cardiopulmonary bypass via femoral cannulation. Ann Thorac Surg 1998;65:1807-8. Vander Salm M, Thomas J. 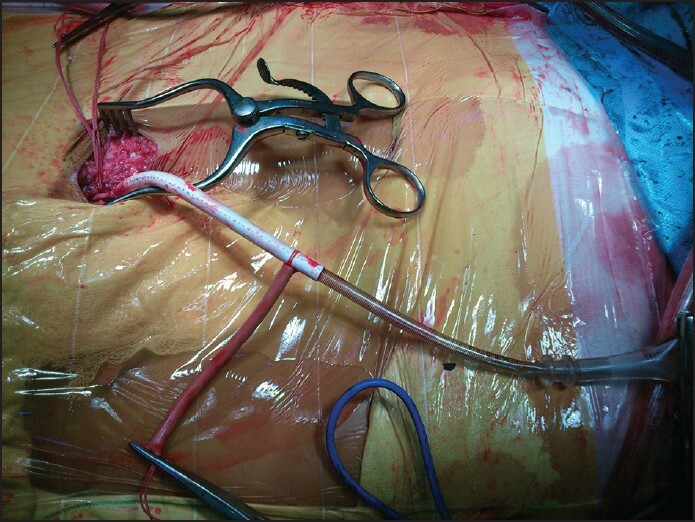 Prevention of lower extremity ischemia during cardiopulmonary bypass via femoral cannulation. Ann Thorac Surg 1997;63:251-2. Schachner T, Nagiller J, Zimmer A, Laufer G, Bonatti J. Technical problems and complications of axillary artery cannulation. Eur J Cardiothorac Surg 2005;27:634-7. Russell JL, LeBlanc JG, Sett SS, Potts JE. Risks of repeat sternotomy in pediatric cardiac operations. Ann Thorac Surg 1998;66:1575-8. Kirshbom PM, Myung RJ, Simsic JM, Kramer ZB, Leong T, Kogon BE, et al. One thousand repeat sternotomies for congenital cardiac surgery: Risk factors for reentry injury. Ann Thorac Surg 2009;88:158-61. Teirstein PS, Vogel RA, Dorros G, Stertzer SH, Vandormael M, Smith Jr SC, et al. Prophylactic versus standby cardiopulmonary support for high risk percutaneous transluminal coronary angioplasty. J Am Coll Cardiol 1993;21:590-6. Gates JD, Bichell DP, Rizzo RJ, Couper GS, Donaldson MC. Thigh ischemia complicating femoral vessel cannulation for cardiopulmonary bypass. Ann Thorac Surg 1996;61:730-3.